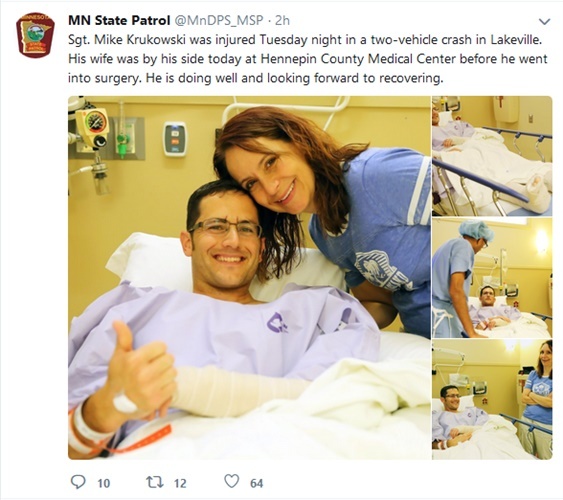 A Minnesota State Patrol trooper continues to recover from multiple broken bones after a speeding car hit his patrol vehicle head on in a crash in Lakeville, MN, Tuesday afternoon. From his hospital bed Wednesday, Sgt. Mike Krukowski, 35, thanked the public for all its support. "Hey everyone. Thank you for your prayers and support and (I'm) looking forward to getting out of the hospital and -- it'll be a bit of a journey but on the way to recovery," he said in the video published on social media Wednesday afternoon. A tweet from the Minnesota State Patrol says he has a broken arm and broken bones in his feet. He's undergone at least one surgery. The crash happened late Tuesday afternoon on a frontage road off Interstate 35, reports KARE. 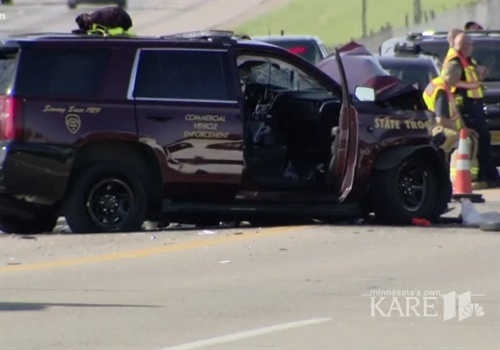 The Minnesota State Patrol reports a 2012 Chrysler 200 was speeding northbound on I-35 when it veered off the road to the right, went through the freeway fence, and struck Trooper Krukowski's vehicle head-on. The driver of the car, a 29-year-old Lakeville man, was airlifted to North Memorial Hospital with serious injuries. His latest condition was unknown as of Wednesday afternoon.